Wear hand gloves or use plastic covers. Cover your face with a cloth. Wear footwear or plastic covers on your feet. Take care to ensure that your entire body remains covered. Use a stick to stir the pesticide. Spray the pesticide on the lower part of the plants, not on the top. Bury pesticide boxes or bottles in the ground or throw them far away. After spraying, wash your hands two or three times with soap and clean water. Change your clothes immediately after spraying and keep them aside to be washed separately. Do not wash pesticide boxes or bottles in running water. Do not blow into the nozzle of the pump. Do not let children below 15 years spray pesticide. While spraying pesticide, make sure you are not facing the wind direction. 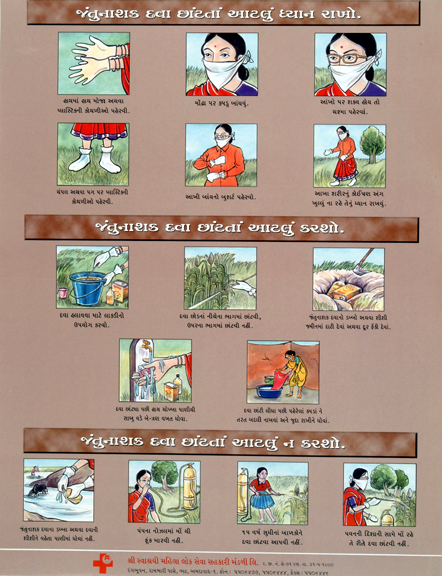 Shri Swashrayi Mahila Lok Sewa Sahakari Mandali Ltd.